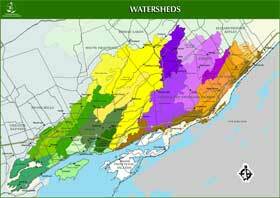 Conservation authorities, including the Cataraqui Region Conservation Authority, rely on a watershed approach to manage natural resources for their communities. Our jurisdiction has 11 watersheds including the large Cataraqui and Gananoque River systems as well as smaller systems such as Wilton and Buells Creek. Our staff include planners, engineers, foresters, biologists as well as communications and education specialists. We also have administration staff who take care of the business end of our operation and operations staff who maintain our properties and facilities. We also work closely with a number of partner organizations and volunteers throughout our communities. Most of the CRCA’s funding comes from a levy on our 11 member municipalities. Some funding still comes from the province, through the Ministry of Natural Resources. With reductions in provincial funding and municipalities trying to minimize property tax increases, the CRCA is always looking for other sources of revenue. Entry fees, user fees and fundraising have been, and will continue to be used as sources of revenue. We also work with partners like other government agencies, non-government organizations and community groups to get projects done. Through sharing of funds and other resources, we are able to accomplish more with our partners that we could each accomplish on our own. There are two meanings to a watershed. The first is the area that the CRCA has jurisdiction over. The whole area from the Bay of Quinte to Brockville. This actually contains ten watersheds or drainage basins. A watershed is all lands drained by a river or stream and its tributaries. It is usually defined by a height of land. Another term for watershed would be a drainage basin.